Does your website look out dated ? When viewed on a mobile phone does your website require a lot of scrolling and zooming? 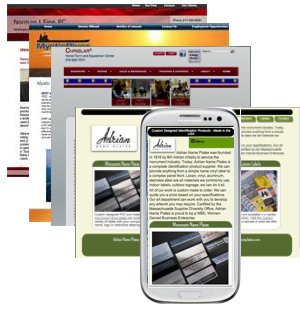 Most modern sites today are built with a Responsive Web Design. A Responsive Web Design will ensure that your website visitors will be able to easily view your website at all screen resolutions — whether it's a desktop, tablet or mobile phone. As of April 2015 Google will start penalizing websites that are not mobile friendly. If your site doesn't display well on a smartphone, your site may be ranked low in Google search results for smartphone users. Why Websites by RC ? I have has been providing businesses with high quality website design and web programming for over 9 years, and have been a web developer since 1994. As a client, you can depend on personal service, and a high-quality, professional, affordable website created by an experienced web designer and web developer. Client satisfaction is a top priority. Work is never out-sourced. Calls are returned promptly. Client requests for a few web site updates are typically completed within one business day. Please contact me for more information on how an affordable website can be created for your business — tailored to your needs and budget.